Trek, Fly, Boat Version of the Packing List for Travel to Costa Rica. Small planes and small boat transfers have weight limits ranging from 15 lbs to 40 lbs so if you plan to travel off the beaten path in Costa Rica you’ll need to plan a packing list for a smaller version of your stuff in a single rugged waterproof bag. For Nature Air the limit depends on how much you pay for your ticket. There are 3 fare classes with 3 different weight limits. Locos – 15 lbs baggage, Promo – 27 lbs baggage, Flex – 40 lbs baggage. Obviously the more you pay the bigger the allowance. For SANSA the limit is 30 lbs in all classes. Size limits depend on which airplane is being used but smaller is better. Oversized items like surfboards, fishing rod cases, or bicycles definitely require advance arrangements and are probably easier to just ship by ground transportation. If space and weight capacity are available you may be allowed to bring more baggage at a rate of $1 per pound. This will depend on the weight of your fellow passengers (everyone is put on a scale at check in). The Bag – The Bag is without a doubt the best ever invented. Surprisingly the label isn’t Arcteryx, North Face, Eagle Creek, Moutainsmith or Black Diamond – they were made by Bike Nashbar (out of production but they occasionally show up on Craigs list at outrageous prices…originally 2 for $69). It consists of two parts. A rugged 36 liter dry bag (black) slides into a cordura compression and shoulder strap “skeleton” with front, two side holster and a top flap pocket for quick access snacks, waterproof camera etc. The dry bag is sumersible waterproof and there is a detachable rigid panel that converts the bag into a pannier for mountain bikepacking or touring. We add a small lumbar pack made by Khumbu (a local Fort Collins Colorado/Nepal cooperative) that functions as a padded waist belt. The backpack is not attached, it just sits on top of the fanny pack. The whole thing is lighter weight than most mid-sized packs and almost infinitely more versatile and functional. The First Aid Kit – Our first aid kit has developed and evolved over forty years of back-country and international travel and goes everywhere with us. It’s a diminutive 4 x 8 x 2.5 inches (10 x 20 x 7 cm) but contains a whole page worth of critical items. Clothes – We prefer plastic (recycled for the most part), bamboo or silk for light weight, durability and quick drying. 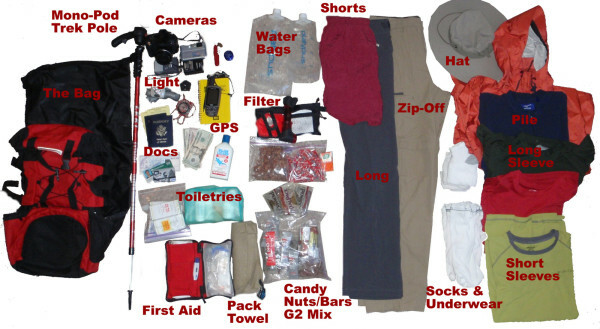 One pair of convertible pants (zip-leg), one pair long pants, swim shorts, hat (nylon wide brim with stow-able neck shade flap), two short sleeve shirts, a long sleeve lightweight breathable poly shirt, a light pile (polar fleece) jacket and an ultralight Gortex rain/wind jacket with hood and pit zips, socks and underwear. Hydration – We like the Platypus water bags which are less than 1/4th the weight of most water tube to your mouth hydration pack systems and have no valves, tubes or gaskets to fail or build up schmutz. Forgoing the “convenience” of a hydration tube also forces us to stop once in a while to take a drink and enjoy our surroundings. Our new hollow fiber MSR Hyperflow Microfilter is the smallest and lightest on the market and delvers an incredible 3 liters per minute (half the size and ten times the capacity of the Sweetwater). We also carry a dozen packets of Gatorade G2 dry mix to replace electrolytes along the trail and a few pharmaceutical rehydrant packets in the first aid kit for emergencies. Snacks – Bear Valley Meal Packs (best bars in the world), Power Bars, Fire Jolly Ranchers, Diamond Wasabi Almonds and orange Tic-Tacs come with us from the states and we pick up fruit and other snacks along the way. Cameras – Between two of us we carry three cameras. A Canon SX60 21-1,365 35mm equivalent optical zoom for wildlife and HD video and a waterproof shockproof workhorse – the indestructible Olympus TG-5. Each has spare batteries, charger and extra memory. Our monopod trekking pole stabilization system is custom made from a Leki telemark backcountry adjustable ski pole with the head assembly from a Manfrotto 785B attached over the grip with a nylon compression ferrule. A spare quick relase mount plate means we can switch cameras in about five seconds and this system allows us to carry a single head that we thread back onto the tripod legs when we’re traveling heavy in an SUV. See the Photography Tips & Packing List for more details. Toiletries – Toothbrush, toothpaste, razor, biodegradable soap, contacts & contact solution, q-tips, kleenex, tampons, and an ultralight recycled plastic pack towel. GPS – the Garmin 60csx is water and shock proof. We have it loaded with the best base maps available for Costa Rica but frankly they stink and we carry it mainly because it is essential for geocoding our routes so we can provide them to you! The yellow waterproof journal and pencil are for taking geolocation notes when we’re not carrying a notebook computer to sync with the gps. We also carry topo maps and an old fashioned svea magnetic compass. Documents – Passport, WHO immunization card, U.S. cash, traveler’s checks (AmEx), credit card, debit card and driver’s license. Swiss Army Knife – scissors, magnifying glass, awl, tweezers with sewing needle added, corkscrew with mini eyeglasses screwdriver added, philips and flathead screwdrivers, can opener, bottle opener and flashlight. The yo-yo is a Tom Kuhn aluminum pocket rocket – a habit I picked up about 4o years before fidget spinners were invented. Especially if you’re taking a very restrictive domestic flight (some fares limit you to 15 lbs) it’s worth wearing at least your boots to help sneak under the baggage weight restrictions. Hiking shoes – These are either light boots or water shoes with good support and tread depending on the trip. White water rafting, kayaking and canyoneering are best in water shoes while hiking, trekking and climbing are boot trips. Binoculars – It’s fun to look out the window and a pair of binocs weighs as much a couple pair of pants. We’ve never resorted to wearing three shirts and our jackets but we’ve heard of people who have. Sports sandals – If we’re wearing hiking boots then we also carry sports sandals. If we’re wearing water shoes we might skip the sandals. We always check bags. We nearly never travel internationally with just a carry-on for a number of reasons – one is that I don’t want to leave my Swiss army knife behind. More significantly our sample maps, camera, gps and computer gear weigh a lot. On top of that we’ve got a couple of extra 50 lb duffel bags filled with climbing harnesses, nursing pillows, baby backpacks, camera lenses, brown sugar, prosciutto – whatever our friends need and can’t get their hands on in Costa Rica. If you can get away with just traveling with a carry on you’ll fly right through the airport and don’t have to worry about the airline losing your bag.